A few of my thoughts Toyota's handling of its recall online is yeserday's ClickZ: News and Expert Advice for the Digital Marketer. The article "Toyota Goes Digital to Communicate Recalls" touches on a few points I made in my discussion with journalist Jack Marshall. He did an excellent job highlighting the key points. Here is the ad Toyota is using in their news network media buy. The messages are very clean and simple without a lot of branding or visual pizazz, which of course is very appropriate in these situations. 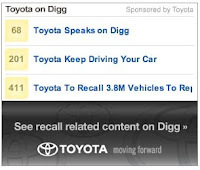 A new Toyota sponsored ad unit bringing in top rated articles on the social linking site Digg is also being used by the brand to direct consumers to Toyota recall information. 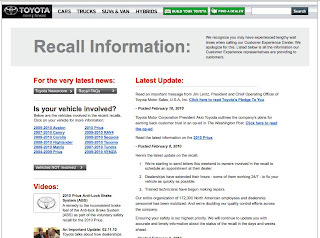 Also, the Toyota Recall landing page is clean and simple to understand, especially the prominence of what vehicles are recalled. The question of what vehicles are affected is always the first question of any owner. 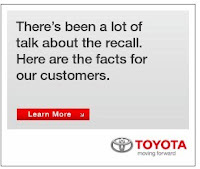 So, it is great seeing the clarity of that message come through on the Toyota recall landing page. Overall I think Toyota is doing the right thing in the online space. Their messages are clear and the ads are showing up on just about every online news story I read about the recall. I will add one last thing that is briefly mentioned in the ClickZ article. Toyota UK has some excellent video communications they have posted on YouTube to let consumers know how the company is responding to the seriousness of the situation. The videos come across in a genuine way that removes the hysteria that might of ensued. Toyota Postpones a "Better Tomorrow"